The DARTS system was designed for retailers by retailers. The basic architecture of the DARTS suite was introduced over thirty years ago. During that span, the application has seen continual development in response to feedback supplied by hundreds of users. Today’s DARTS is the result of the kind of development that can only come over time. 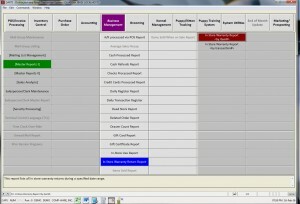 Comp-Ware Systems designed DARTS as a management and marketing tool. Few purchases can have as dramatic an effect on your business as a point-of-sale system. The right one will give you a new level of control over your operations; increasing efficiency, boosting profits, and helping you fine-tune your business. The wrong system can be a waste of money and a source of ongoing frustration. Our system went exclusively to the Pet & Feed industry back in 1985. That means we sell solely to pet retailers, feed stores, pet wholesale distributors, and pet product manufacturers. As you know, the Pet & Feed industry is unique in many ways. While other systems try to be a jack-of-all-trades (and usually become masters of none), Comp-Ware has devoted all of its resources to make DARTS the best system in the Pet & Feed industry.